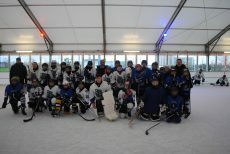 Mr. Robert Norwood, 2nd Vice-President of the Olympic Council of Ireland has attended the new year’s first Ice Hockey tournament at Ice Skating Blanchardstown where The Flying Ducks played against the Cork Wolfpack on Saturday 6th of January from 7 to 10am to show support. There were games for Under 12, 14 and 18 teams, and The Flying Ducks won well in the Under 12 and 14s but the premier game of Under 18s was an end to end affair. After ending 5-5 the Cork Wolfpack took the win with 3 goals to 2 in a penalty shoot-out.